the millions of gallons of oil bubbling from the sea floor weren’t all collecting on the surface where it could be skimmed or burned. Some of it was forming a plume and drifting through the ocean under the surface. We already have a library of molecules that can grab oil, but the problem is how to get them into a useful structure and bind them there permanently. After some trial and error, they found a way to adapt the technique to grow an extremely thin layer of metal oxide ​“primer” near the foam’s interior surfaces. This serves as the perfect glue for attaching the oil-loving molecules, which are deposited in a second step; they hold onto the metal oxide layer with one end and reach out to grab oil molecules with the other. The team is actively looking to commercialize the material, Harvey said; those interested in licensing the technology or collaborating with the laboratory on further development may contact partners@​anl.​gov. The research was funded by the U.S. Coast Guard and the Bureau of Safety and Environmental Enforcement. The team used resources of the Center for Nanoscale Materials, a DOE Office of Science User Facility, in the development of the material. How does oil wind up below the surface? Oleo Sponge can be wrung out, the oil collected, and the material reused—it has stood up to dozens of cycles so far without breaking down. Photo by Mark Lopez/Argonne National Laboratory. Oleo Sponge can pick up oil that has dispersed into the water column, not just a slick sitting on the surface—which no commercially available products can do. Photo by Mark Lopez/Argonne National Laboratory. Argonne scientists tested the material’s performance in saltwater at Ohmsett, the National Oil Spill Response Research & Renewable Energy Test Facility, a massive outdoor seawater tank in New Jersey for testing cleanup technology. Photo by Mark Lopez/Argonne National Laboratory. 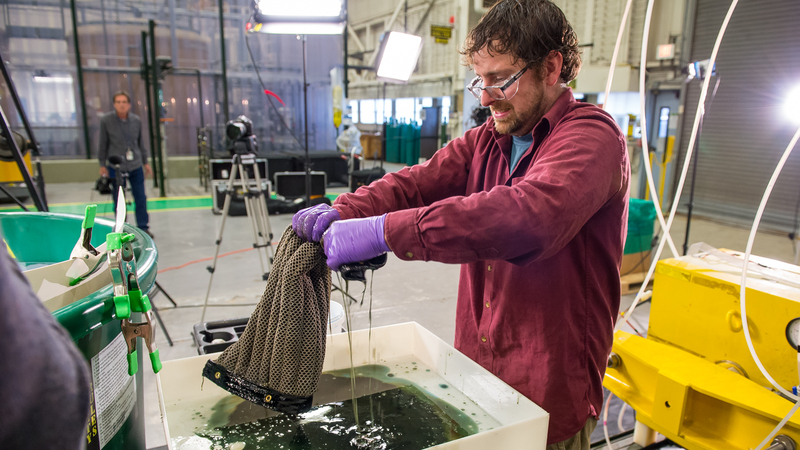 Oleo Sponge picks up oil during tests at Argonne. Photo by Mark Lopez/Argonne National Laboratory. Argonne scientist Seth Darling, who co-invented the material, watches as the Oleo Sponge collects dark brown oil from the water during tests at Ohmsett. Photo by Mark Lopez/Argonne National Laboratory. Scientists at the U.S. Department of Energy’s (DOE) Argonne National Laboratory have invented a new foam, called Oleo Sponge, that addresses this problem.